My review of The Vines of Mendoza for The Independent. In the shadow of the high Andes, west of Buenos Aires is Mendoza. The region is the location for the Uco Valley’s first luxury resort – and the latest installment in The Vines of Mendoza’s story. It started out a decade ago as the pipedream of a former American political campaigner and his Argentine oenologist business partner. The company sold private vineyards to wannabe winemakers and its own terroir materialised into something beyond either of their expectations. 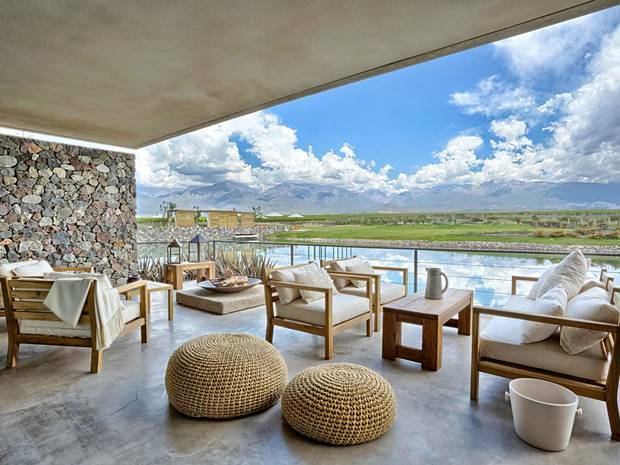 The Vines Resort & Spa opened in February 2014, with 22 standalone villas set among the vines that are perfectly at home in the stoney topography of the Andean foothills nearby. Making use of local resources, such as rocks from the 500-hectare property, the look is rustic-chic. It blends in with nature but still provides state-of-the-art comforts, which can be hard to locate in rural parts of Mendoza. For the rest of this piece, please visit The Independent.